Remember when your head would jerk in the direction your mom ferociously brushed it? Don’t relive those tortuous moments! Since our natural hair coils and springs back into place when we let it go, it’s even more important to hold the section of hair we’re detangling. If we let go, we “lose our place” so to speak, and all the combing and recombing can take a toll on our hair and tender heads. Don’t forget to twist that section once you’re done or place it back in a clip (refer to first tip). It’s easy for our coils to snag on rough fabrics. Satin or silk is a smooth and soft textile that your coils won’t get caught in. Depending on your preference, you can wear a satin cap, a satin scarf, or sleep on a satin pillowcase. Since I’m the type to forego a bedtime routine and just collapse into bed, a satin pillowcase was the way to go. Concentrator attachment on blow dryers are better for my fine hair than the comb attachment when I do blow outs. I pull a section of hair taut, and the attachment concentrates the heat to that section, stretching it out. Butterfly clips. I switched to these claw-like clips after I noticed duckbill clips always got caught in my hair. “No snag” or no-metal headbands & hair ties. Seriously. Who puts metal on a headband? O.U.C.H. 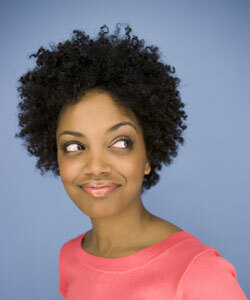 The more we tousle our hair around, the more opportunities we have for tangles and breakage. Try to fight Hand In Hair Syndrome and opt for twists, braids, buns, etc. I personally prefer to wear my hair loose, but I know a lot of naturals swear by low manipulation hair styles. How do you handle your coils with care?